Many students hold debilitating beliefs about their intelligence. They believe things like, “I’m not smart enough” or “This subject just isn’t for me.” These beliefs can be especially damaging during the academically and socially challenging transition to high school. Left unaddressed, these fears can become self-fulfilling prophecies that feed a destructive cycle of reduced motivation, engagement, and academic performance. However, research shows that schools can boost performance—particularly for students with a history of academic struggle—by helping students develop a growth mindset: the belief that they can develop their academic abilities through effective study strategies. Growth Mindset for 9th Graders is designed to help students understand that academic aptitude can be improved. Scientific evidence showing that the brain is malleable. Specific behaviors that can rewire the brain and increase one’s intellectual abilities. The importance of effective study strategies and of getting help from others. 6.4% point increase in satisfactory course completion among students who had a GPA of 2.0 or below prior to the program. 4% point increase in satisfactory course completion among underperforming students in a replication and extension of the study above. We are thrilled to make Growth Mindset for 9th Graders available to all high schools in the United States. This program is free thanks to the generous financial and programmatic support from The Character Lab, the Bezos Family Foundation, and the Raikes Foundation. Download the Program Information Packet to learn how participation works. Create a user account and prepare to participate using our online platform. 9th grade students complete the two 30-minute web modules during class. The modules should spaced about 1-4 weeks apart. See how many students completed the program, and receive a report about the program's impact at your school. Download the Program Information Packet to learn more about the research and how to run Growth Mindset for 9th Graders at your school. We suggest reading through the packet and reviewing it with your colleagues before signing up. Enter your email — You will receive a link to our online platform where you will be able to sign-up and prepare to participate. PERTS is an applied research center based out of Stanford University. We believe that evidence-based strategies should benefit all students, not just the privileged few. To make research accessible to all, we empower educators everywhere to implement evidence-based strategies cost-effectively. We are so excited to bring you Growth Mindset for 9th Graders and to make the latest research on growth mindset strategies actionable to every high school in the United States. Growth Mindset for 9th Graders is based on a long line of studies conducted by researchers at Stanford University and the University of Texas at Austin, including Drs. Carol Dweck, Dave Paunesku, Carissa Romero, Greg Walton, and David Yeager. The Growth Mindset for 9th Graders module was developed and tested through the National Mindset Study, a project of the Mindset Scholars Network led by Principal Investigator David Yeager which was supported by ICF International and PERTS. The software, logistical processes, and materials used to help schools run Growth Mindset for 9th Graders were created by PERTS in partnership with multiple schools across the country. Read about PERTS and the mindset programs in the New York Times. 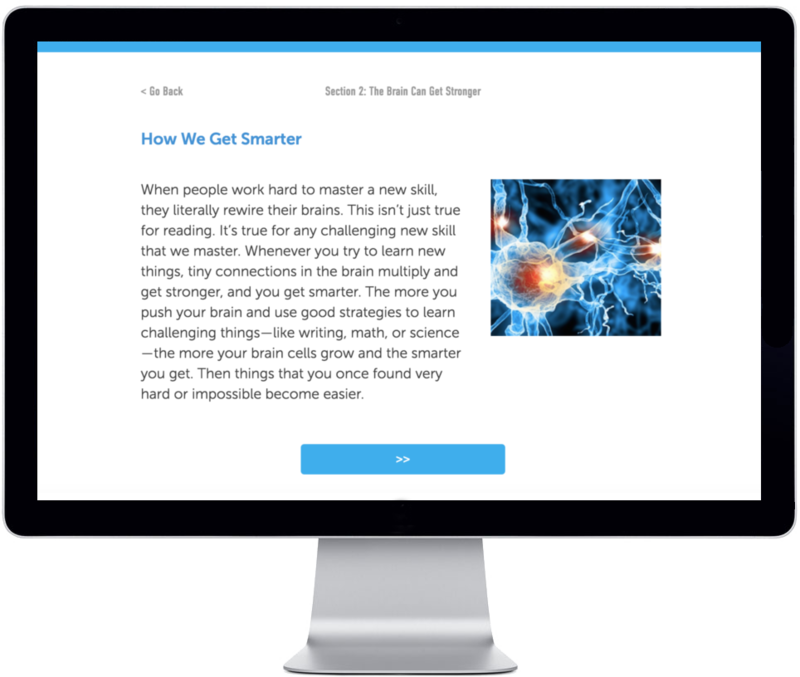 Get more background about mindsets from the Mindset Scholars Network. Read published research articles about our work to advance mindset science. Thanks to the generous financial support from The Character Lab, the Bezos Family Foundation, and the Raikes Foundation, we are thrilled to make Growth Mindset for 9th Graders freely available to all high schools in the United States. In doing so, we hope to advance our mission to empower educators everywhere to implement evidence-based strategies effectively.